A new study suggests that many of the state's birds are adapting to rising temperatures by breeding earlier than they did a century ago. A comparison of nesting data recorded in the early 1900s with similar data today for more than 200 species of California birds shows that overall they are breeding five to 12 days earlier than they did 75 to 100 years ago. Earlier studies found that many but not all birds in California's mountains are moving north or to higher elevations to find cooler temperatures in the face of global warming. "The shift to earlier breeding that we detected allows birds to nest at similar temperatures as they did a century ago, and helps explain why half the bird species in the mountainous areas of California did not need to shift upward in elevation in response to climate warming over the past century," said co-author Steven Beissinger, a UC Berkeley professor of environmental sciences, policy and management. The study, led by former UC Berkeley graduate student Morgan Tingley, now an assistant professor at the University of Connecticut in Storrs, UConn postdoc Jacob Socolar, former UC Berkeley postdoc Peter Epanchin, now of the United States Agency for International Development, and Beissinger will be published online the week of Nov. 13 by the journal Proceedings of the National Academy of Sciences. Early spring arrivals have long been noted by the public and reported by scientists, but the assumption has been that the birds are tracking resources, primarily food: with warming temperatures, plants produce leaves and seeds earlier, and insects emerge earlier. The new study spotlights another major reason: By nesting a week earlier, birds produce eggs and young at a temperature about 1 degree Celsius (1.8 degrees Fahrenheit) lower than if they nested at the normal time in the same place. This exactly counterbalances the approximately 1 degree Celsius increase in global temperatures over the past century. "By nesting a week or 10 days earlier, birds are avoiding some of the negative effects of climate warming," Beissinger said. "The good news is that there may be more flexibility for species to respond to climate change than we thought, and not all species may need to move farther north or to higher elevations," he added. "But we don't know yet whether staying in place and shifting schedules earlier is a permanent solution, or only provides temporary relief from the 2 degree Celsius (3.5 degree Fahrenheit) rise in temperatures forecast to occur." Birds may find, for example, that the window of good temperatures for breeding becomes shorter, which may limit the opportunity to re-nest if they fail the first time. 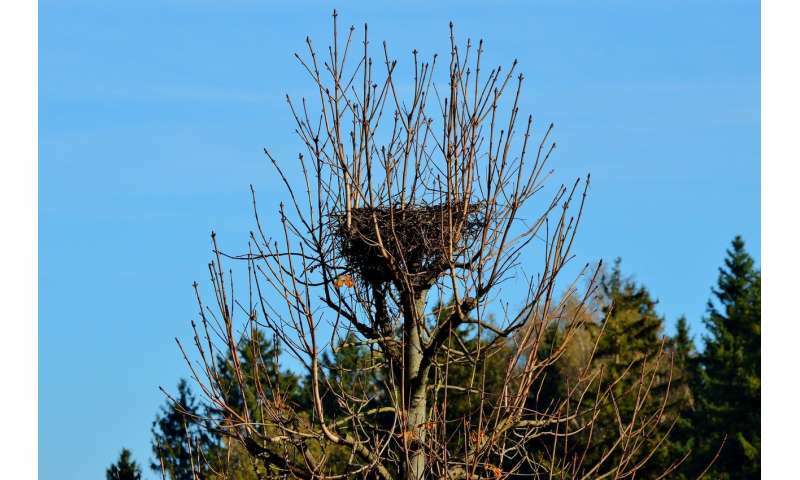 Larger species that have a longer nesting period might not have a enough time to complete their nests before it starts to become too warm, he said. The researchers used historical data on animal species and numbers collected between 1911 and 1929 by UC Berkeley biologist Joseph Grinnell and his colleagues and students. These data have proved invaluable for assessing how the state's birds and mammals have altered their geographic and elevational ranges over the past century. In 2009, Tingley, then a UC Berkeley graduate student, and Beissinger used this data to show that about half the state's birds had physically moved northward or to higher elevations to escape the heat as temperatures increased over the past 100 years. With the Grinnell survey data as a baseline, UC Berkeley researchers have conducted resurveys of the entire state as part of the Grinnell Resurvey Project. Beissinger and his colleagues focused on the bird data, looking at the shift in nest timing for 202 species across most of northern California, from the northwest coast to Monterey, and in the western mountains from Kings Canyon and Sequoia national parks to Lassen National Park. To help understand the relationship between temperature and nesting, the researchers also accessed data from 47,023 monitored bird nests across North America from over 100 species that had been collected by citizen scientists contributing to Project Nestwatch, run by the Cornell Laboratory of Ornithology in New York. Analyzing these data, the researchers discovered that nesting success varied significantly on the fringes of birds' breeding ranges: At warmer temperatures, birds on the northern, cooler fringes saw higher success, while those on the southern, hotter fringes saw less breeding success. "In the colder parts of the breeding ranges, abnormally warm summers increase the survival of nestlings, but in warm southern parts of ranges, abnormally warm summers decrease their survival," said Tingley. "Breeding earlier means breeding colder, and temperature matters for survival of nestlings." "Previously adaptations of range changes and timing changes have always been thought of separately. What we show is this might not be so simple and they could be intertwined," said Socolar. Are puffins and auks nesting earlier on Greenland, because I certainly don't see any wheat, barley or dairy cattle. No evidence for wheat growing in Greenland at all. Zip, zilch, nada. The evidence for barley consists of a few scorched grains in a single layer at the bottom of one trash heap. "The find also substantiates a well-known text from about 1250, 'King's mirror (Konungs skuggsjá)', which mentions in passing that the Vikings attempted to grow grain on Greenland. It is the only report about cultivating barley that we have from that time and says: "As to whether any sort of grain can grow there, my belief is that the country draws but little profit from that source. And yet there are men among those who are counted the wealthiest and most prominent who have tried to sow grain as an experiment; but the great majority in that country do not know what bread is, having never seen it.""